Oak Newspaper Rack -- Organization is the Key! 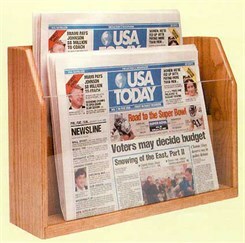 Organization is the key to a neat work environment, and this newspaper rack is the link to organization! Perfect size for counters and tables. Solid oak sides and bottom with an oak veneer back. Back row is elevated; front is acrylic. Pockets are 16-1/2"W. Overall 17-3/4"W x 4-3/4"D x 12-1/2"H. Shpg. wt. 12 lbs. PRICE INCLUDES FREIGHT! Please allow 1-2 weeks for delivery.